ABOVE: A motoscafo (foreground) and a vaporetto on the Grand Canal. In Venice's centro storico or historic center, which is made up of more than 100 islands, water buses are the equivalent of buses and subways on dry land. 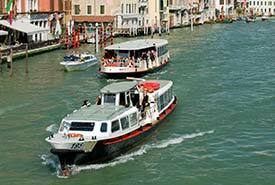 ACTV, the public-transportation authority in Venice, operates vaporetti and other water buses around the clock, with a fleet of 150 boats and routes that extend into the far corners of the Venetian Lagoon. When you're tired after a day's sightseeing and you're willing to pay a premium for a ride back to the neighborhood where you're staying. In this article, we'll describe the different types of vaporetti, motoscafi, and motonavi in Venice's ACTV fleet. We'll also tell you how to board and use the boats, how to avoid crowds during high season and holiday weekends, and what you need to know before boarding a water bus with luggage. For even more information (including routes, fares, and tourist passes), please click the links in the "Related articles" menu at the bottom of each page.